Lori Adelman at Feministing is taking on Google for its strange policy of banning abortion providers from advertising on Google AdWords in specific countries. I'm pretty disturbed by Google's ability to withhold information about reproductive health services in these countries without justification or accountability. Call me crazy, but it seems to me that women living in the countries in question should be granted the same access to reproductive health services as women in other parts of the world. 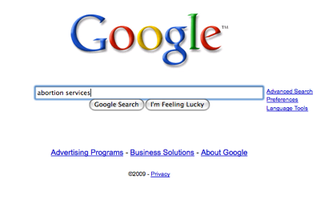 Although abortion services are not blocked on Google searches (not to mention that internet ads are probably not the best place to look for medical services), there is still something unsavory about Google's decision to prohibit advertisements for certain controversial services in some regions of the world but not others. The issue of abortion is an emotive subject and Google does not take a particular side. Last September, we reviewed our abortion ads policy in order to make sure it was fair, up to date and consistent with local customs and practices. Following the review we decided to amend our policy, creating a level playing field and enabling religious associations to place ads on abortion in a factual way. We decided to disallow ads for abortion services, such as abortion clinics, in the following markets: Germany, Poland, Hong Kong, Taiwan, Singapore, Malaysia, Philippines, Indonesia, Argentina, Brazil, Mexico, Peru, France, Italy and Spain. However, general, factual ads on abortion continued to be allowed and we also enabled religious associations to place ads on abortion in a factual way. When pressed, they did not give a more illuminating answer, but simply said: "we conducted the review and made the change to ensure our policy was fair, up-to-date, consistent with local laws and codes of practice." Feministing urges readers to email Google (press@google.com) to urge them to alter their standards.